Vanceboro, NC Bojangles'® Tands, INC. Store #44 - Bojangles'® / Tands, Inc. 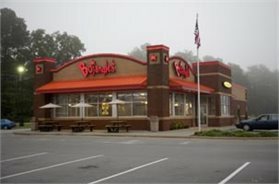 Located in the heart of Vanceboro, NC, Bojangles’® is a favorite spot in town for great fried chicken and friendly service at affordable prices. Located near West Craven High School, we are a great place for students to hang out. And to party before or after an Eagles game, it’s Bo Time! The Big Bo Box is an easy and convenient Bojangles’® menu choice to feed the whole group. Bojangles’® is well-loved for our southern-style cooking and comfort food. Our fried chicken is always a hit, and Vanceboro can’t get enough of our flaky biscuits, made daily from scratch. Bojangles’® is open early and has delicious, filling options for breakfast, lunch and dinner. Come in to our Vanceboro, NC Bojangles’ on Hwy 43 and curb your cravings!